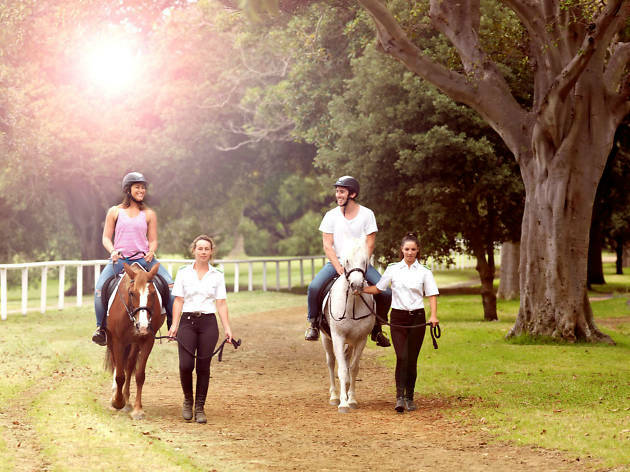 The beautiful and vast Centennial Parklands has great walking and cycling tracks, but it’s also one of the world’s only urban parks with riding facilities, with five riding schools that can take you out for a trot any day of the week. Take your pick for riding lessons or pony parties from Sydney Horse ($60-$90pp), Eastside Riding Academy ($100pp), Budapest Riding School ($90pp), Centennial Stables ($95pp) and Papillon Riding School ($95pp). Most of the schools are open daily and they’ll help you saddle up for a ride around Centennial Park’s picturesque 3.6km horse track. 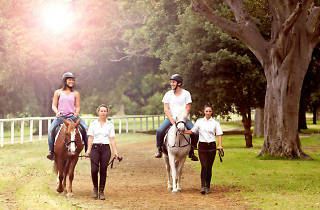 Horse riding has always been part of the Parklands’ history and has been taking place since it opened in 1888. Open 365 days a year, the Equestrian Centre is home to 200 stables onsite. The best way to enjoy it is to take a one-hour circuit of the park with a professional instructor.